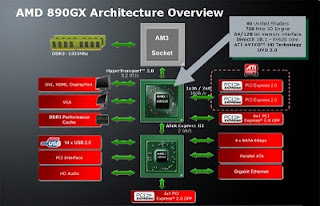 AMD alongside several of the companies motherboard partners today announced the release of the new AMD 890GX Chipset featuring ATI Radeon HD 4290 on-board Graphics. The new 890GX platform not only includes superior graphics but will also feature support for ATI CrossFireX, the SATA 3.0 6Gbps hard drive interface, USB 3.0, Gigabit Ethernet, HyperTransport 3.0 technology, and PCI Express Generation 2.0. Among the first companies to announce boards based on the new chipset are Gigabyte, MSI and ECS.